Vanessa: First of all, how should we call you? Ven Palmo: Palmo is good. Vanessa: When were you first exposed to the Buddhism? Ven. Palmo: At the end of 1999. Vanessa: Can you describe that first experience? Ven. Palmo: It started with my friend who was helping her dying mother. She introduced me to a book called Tibetan Book of Living and Dying by Sogyal Rinpche, which gave Buddhist techniques that would be beneficial for me to help my parents when they were dying. I used to read it when I was riding the bicycle at the gym or sitting at home. Then my friend bought a flyer home that advertised a teaching by Ven. Robina called “Be Your Own Therapist.” My friend and I trucked out there and listened. There was nothing that came out of Ven. Robina’s mouth that I didn’t agree with. It connected me with some of the ideas I had in the 70s that I set aside during the 80s and 90s. It felt right. Ven. Palmo, Ven. Chokyi, Ven. Katy with Ven. Robina (center) on pilgrimage in Myanmar in 2013. Photo: Dalgish Chew. Vanessa: Was there one thing the stood out from Ven. Robina’s teaching? Ven. Palmo: Not one because she talked about the mind, karma, rebirth. I already believed in rebirth and karma. Everything made sense about watching your mind, being in more control of your mind. It bridged the time when I was more spiritual and bought me back on track. In the 70s I wanted to be enlightened, but I didn’t know exactly what that meant. Buddhism actually clarified ideas from before and corrected me where my mind was steering off in the wrong direction. In the 70s I was opening my heart and becoming kinder and more loving, much of what I heard was a way back to that. Vanessa: How can Buddhism benefit people regardless of their religious or spiritual background? Ven. Palmo: It gives people tools to work with during difficult situations and that helps them to be more skillful in ways that would be of benefit to themselves and others. One of these tools is meditation. With meditation, we can recognize mistakes in our thinking and make adjustments to obtain more peacefulness and clarity. In cases of difficulty, we can use calmness to resolve problems more effectively. Vanessa: Can you meditate without studying Buddhism? Ven. Palmo: Sure. Meditation is not Buddhist at all. It’s one of the tools Buddhists and some Christians and others use. There are different kinds of meditation that can be done, even when sitting on the bus or in your car. 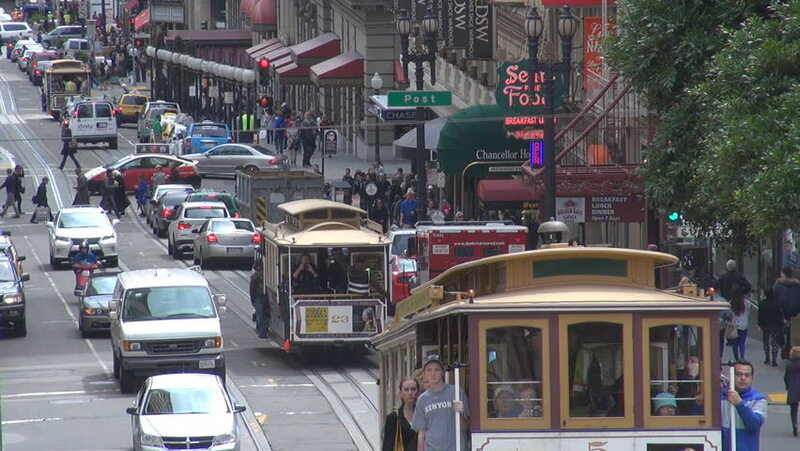 San Francisco traffic. Photo: Shutterstock. Vanessa: How can we meditate while stuck in traffic? Ven. Palmo: I used to meditate on developing equanimity while driving to and from work. The first step is recognize that everybody wants to be happy, and does not want to suffer. Every time I stopped at a light I would observe the people around me and think they’re just like me, just wanting to be happy. Whatever they were doing, whether I agreed with it or not, was to try to be happy. Vanessa: What if that person cuts us off and gives us the finger? Ven. Palmo: Well, then we can try practicing patience. You need to become aware of your mind. Let’s say that person cuts you off, or they’re upset with you because you’re going too slow and gives you the finger. You have this whole dialogue in your mind. You can ask, “Why is this making me upset?” Look inside to see what’s happening. When someone cuts me off in traffic, I ask myself, “Why am I getting upset?” And what I see is that I’m taking it personally, thinking this is my space or my lane. I can get annoyed because they are driving recklessly or somehow they are getting in MY way . It’s the unsatisfied mind you can see when you have the expectation that there should be no obstruction on the road and everyone should behave nicely the way you expect. The truth is you getting angry only harms you by making you miserable and doesn’t do anything to the other person. FPMT Spiritual Director Lama Zopa Rinpoche in Portland, OR in 2006. Photo John Berthold. Vanessa: Speaking of expectations, many people developed fear and anxiety after their expectations weren’t met after the election results. How can Buddhism help us ease those unwholesome states of mind? Ven. Palmo: That’s a really tough question. There are different levels of anxiety depending on the individual. There can be more anxiety if you’re an undocumented immigrant, Muslim or supporting a woman’s right to choose. But I think there are tools that can help each individual. People need to come to a place where they that can hear Buddhist teachings and consider certain practices. Part of it is looking inward and recognizing the results of our actions. For example someone asked Lama Zopa Rinpoche, “What do you think of Donald Trump?” Rinpoche said, “He is your karmic appearance.” We have to look at that and ask what does that mean and how can we can remedy it. Vanessa: What kind of remedy can we use to ease the post election anxiety? Ven. Palmo: I like to watch the news because I like to watch my mind watch the news. The key is to start meditation with concentration, like breathing, because it helps to calm the mind. You learn to watch what aggravates you and use techniques to stop it if you want. We embellish what is happening with stories, our own stories, and latch on to them. All of a sudden we have exaggerated things until we’re irritated or fearful, which causes us to suffer. Lama Zopa said, “It’s your mind and it’s your choice to be happy or miserable.” Having a happy, calm mind doesn’t mean being complacent or not working to help others. Getting upset and angry ourselves doesn’t help anyone. Vanessa: If someone has little or no experience with meditation what advice would you give him or her? Ven. Palmo: Start with breathing meditation and make the time to sit down every day, even if it’s short. When you try to focus on the breath at first you may think your mind is getting worse. You will see how crazy the mind is. When we jump into anger about something, we don’t see the thought process that brings up those negative emotions. By doing mediation we can get things settled enough in order to deconstruct the destructive patterns, and use antidotes we have learned to settle the mind. When you start meditation let go of any expectations, and don’t worry about the results. Too much worrying in advance is useless. The worry doesn’t help. Vanessa: What advice do you have for someone who has difficulty meditating in one posture or has a racing mind? Ven. Palmo: Practice slowing the mind with short meditations until you become accustomed to longer sessions. If there are body issues and you can’t sit cross-legged, sit in a chair. There’s also walking meditation. Vanessa: Is it possible to travel the path to enlightenment without meditating? Ven. Palmo: You can start on the path to enlightenment without meditation, but if you expect to finish it meditation is a must. Meditation actually helps to gain realizations. You can gain some insights while you’re moving, but realizations come from time on the cushion. It depends what you do with your mind, but you do need to learn how to gain control of your mind. That’s where meditation can help. The truth is when people start to meditate, it always looks worse than expected. The first step of meditation happens when you notice how wacked out, crazy your mind is. Noticing it is a cause of celebration! Vanessa: So people should rejoice when they see that their mind is going crazy during meditation? Ven. Palmo: Yeah! Because you’re finally seeing what you’ve been doing all the time. By seeing it you then can begin to change it. Vanessa: Orange County is known for conspicuous consumption such as nice cars, houses, etc. Do those conditions pose a challenge to one’s Buddhism practice? Ven. Palmo: No. I have a nice house in San Francisco and I drive an old Mercedes to get to far places. But if you’re life is consumed with your possessions then it could become a problem. The more resources one has, the more they can help benefit others. 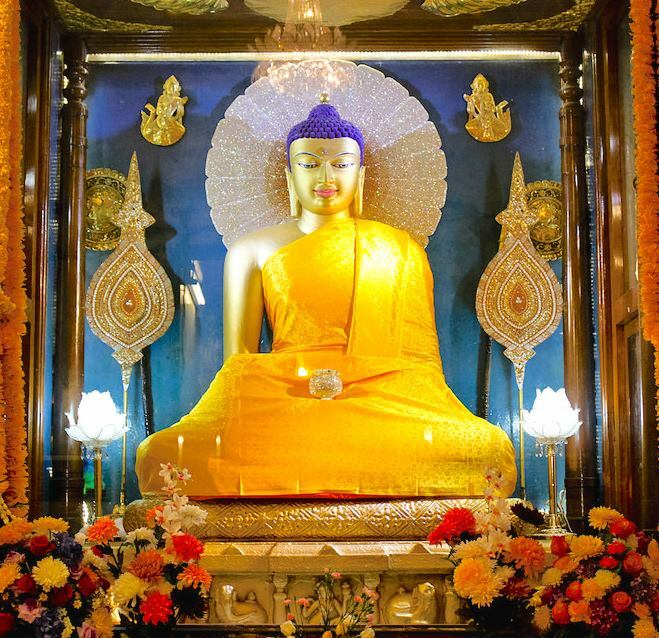 Photo: The statue of Shakyamuni Buddha at the Mahabodhi Temple in Bodhgaya, in Northern India, where the Buddha is said to have attained enlightenment, while meditating under the Bodhi Tree. Jamyang190. Vanessa: The Buddha left his wife and child in the middle of the night. Some people would see that as abandonment. How would you explain the Buddha’s actions? Ven. Palmo: Today it would look like abandonment. But what I think is that he saw the suffering of the people in his kingdom. He wanted to end suffering, including the suffering of his wife and son. Everyone was going to experience the sufferings of getting old, getting sick, and end up dying, no matter how good their conditions were. If you look at the bigger view, he did it to find a way to end suffering for his wife and child and all other sentient beings. Vanessa: How can one who works full time to support a family commit to a Dharma practice? Ven. Palmo: It is more difficult. Each person needs to figure out how to use his or her time. The truth is having a family is a huge Dharma practice. Your life is a Dharma practice. Whether it’s kids, aging parents, a traffic jam, or a difficult political situation, you can turn anything into a Dharma practice. Vanessa: What advice would you give to some who gets overly excited about Buddhism and immediately jumps into intense meditations and retreats? Ven. Palmo: I would tell people to be careful. Usually when somebody gets too excited and jumps totally into retreats and does this and that, it’s simply because they want a quick result. And often in the West, we think results should happen in a flash, like turning on a computer and Googling something. We expect all kinds of amazing things to happen because we’re reading about amazing experiences others have had. This can lead to disappointment. The thing to remember is that the changes we experience in Dharma practice comes slowly. The best thing to do is go slowly. I would say relax; don’t worry. If you are consistent change will come.